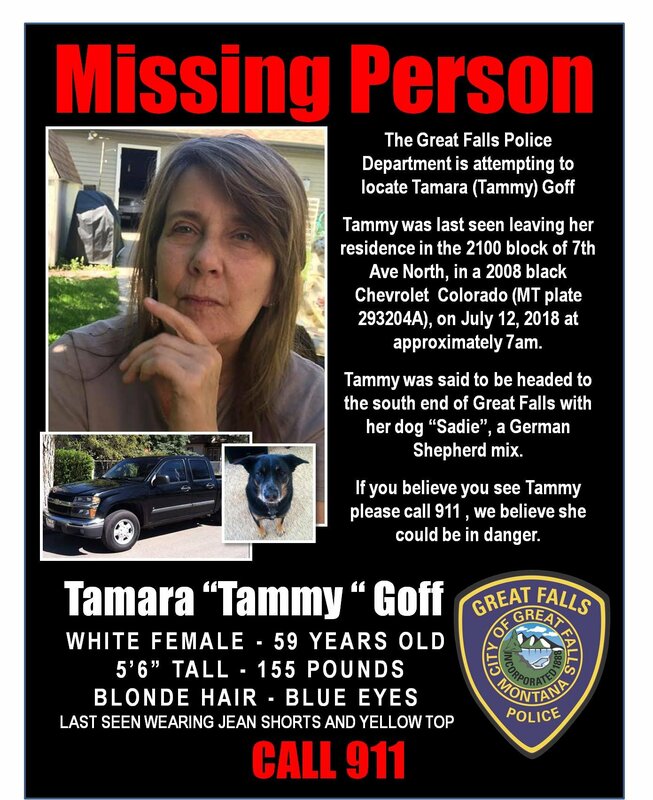 The search for Tamara “Tammy” Goff continues in and around Great Falls; she was reported missing on Friday, July 13th. We thank everyone who is calling, texting, emailing wanting updates or just seeing what they can do to help bring Tamara Goff home. The search continues, Unfortunately! While hunting season is here and change of seasons, I ask all of you out walking, riding ect. please keep look out for her truck. WE APPRECIATE ALL OF YOUR TIME, ENERGY, AND HELP!!! Anyone with information about Tammy or that may help the investigation is asked to call the GFPD or 911. HELP BRING TAMMY HOME! Sergeant Mitchell reports the investigation into Tammy Goff’s disappearance continues. We did confirm a sighting of Tammy’s vehicle on Lower River Road approximately an hour after she left her home. And, after being found on Hawk Drive one day after Tammy’s disappearance, Sadie, Tammy’s dog, is in good health and safe with Tammy’s family.